Do yourself a favour. If you’re a home cook who loves to bake, you could do so much worse than treat yourself to Belinda Jeffery’s ‘Mix & Bake’. Everything is explained, loads of great tips and the recipes I’ve found to be failsafe…always elegant but striving for simplicity. They’re country, they’re scrumptious and they’re grounded in the real joy that comes from producing something that makes everyone around you hum with pleasure for your efforts. Oven on 180 degreesC or lower slightly if you’re using fan forced – you know your oven! Put the flour, baking powder, salt and bicarb into a food processor and whiz for 15 secs, then tip into a bowl and set it aside. Mash bananas and measure out your cup of pulp. Scrape into processor and puree until smooth. Add the sugar and eggs and whiz for a minute. Add butter and whiz for another minute or until the mix is thick and creamy. Add the buttermilk and vanilla extract but pulse the processor in quick on/off bursts to just mix them in. Add the flour mix and again mix it in with quick bursts, scraping down the side with a spatula until just combined. DON’T OVERDO OR THE CAKE WILL BE TOUGH. Scoop into the tin and smooth evenly. Bake for 30-35 mins or until a fine skewer inserted in the middle comes out clean. It doesn’t rise a lot as it’s quite dense. Dont be tempted to open the oven early or it will undoubtedly sink. Cook in tine on a wire rack for 7 mins, then gently loosen the cake around the edges with a butter knife and invert onto rack to cool completely before you slice into two layers with a serrated knife. To make the icing whiz the cheees and better in the food processor until well combined. Add icing sugar and vanilla extract and process until smooth. Chill for 15 mins if it’s warm in your kitchen so it’s firmish to work with. Sandwich layers with icing and then ice as you wish. Belinda’s is iced all over – I chose to just sandwich with the icing and then thickly ice the top. Keep well in the fridge for a week but let it warm up before you serve. Never lasts in our house – my sons are eating it the second I turn away from icing it! Enjoy. Fabulous recipe, I use it all the time . This is indeed to ‘go to’ banana cake that should be ‘got to’ whenever possible. Leave all other banana cake recipes to flounder at the bottom of your recipe drawer. 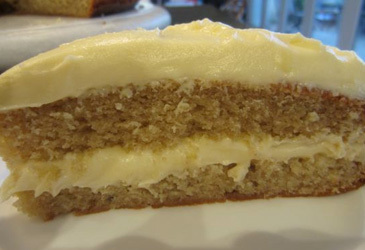 Great banana cake recipe. Also I can’t praise mixnbake by Belinda Jeffery highly enough. I have cooked so much from it.